Binomial Theorem is a very intriguing topic in mathematics due to its wide-ranging application. Before moving forth with its use, let me ask you a question? Do you remember what’s is (a + b)2 or (a-b)2? I guess most of you would have easily say (a+b)2 is a2 + b2 + 2ab and (a2 – b2) is a2 + b2 -2ab. But, what about (a + b)4? Okay, this is something you can still deduce. Let’s make it a little bit more complex, can you tell what the expansion for would be (a + b)7 or (7a – 5b)10. Now, I think it would not that simple to answer as you did earlier. Here’s something where the binomial Theorem can come into practice. And, in fact expansion of expressions such as is (a + b), (a-b)2 or (a + b)3 have all come through the use of Binomial Theorem. 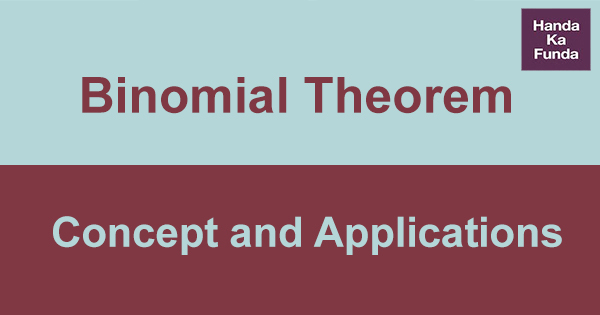 I hope that now you have understood that this article is all about the application and use of Binomial Theorem. Many of you might be well acquainted with binomial Theorem specially those who had mathematics in their high school and those of you who know nothing about you will learn everything that’s necessary about it in this article. Let’s dig a deeper meaning in the nomenclature “Binomial Theorem/ Expansion”. Now Binomial means sum or difference of two terms and Binomial Expansion is the expansion of that sum of two terms. Since we have learnt what literally the meaning is, now is the time for some mathematics. The coefficients of (r + 1)th term in the expansion of (1 + x)n is nCr. The coefficient of xr in the expansion of (1 +x)n is nCr. The positive integer n is called the index of the binomial. Number of terms in the expansion of (x + y)n is n + 1. In the expansion of (x + y)n, the power of x goes on decreasing by 1 and that of y goes on increasing by 1, therefore the sum of their powers should be equal to n.
The binomial coefficients of the terms equidistant from the end and the beginning are equal. If n is odd, then the number of terms in (x + b)n + (x – b)n and in (x + b)n – (x – b)n are equal to (n + 1)/2. If n is even, then the number of terms in (x + b)n + (x – b)n are (n + 1)/2 and in (x + b)n – (x – b)n are n/2. nC3 = n (n – 1) (n – 2)/ 3! We can now move to some basic application of the above learned concept that can come in competitive exams such as CAT, XAT, IIFT, SNAP etc. Hence, the coefficient is 60. ⇒(100 + 1)50 = 10050 + 50.10049 + [(50. 49)/ 2. 1]. 10048 +…. and 9950 = (100 – 1)50 = 10050 – 50.10049 + [(50. 49)/ 2. 1]. 10048 – …. Hence, last digit of 32)32 = last digit of 232 = last digit of 26. 4= last digit in 4 x 4 = 6. Method of Finding Independent term or constant term. i.) Write down the general term in the expansion of (x + a)ne. (r + 1)th term. ii.) Separate the constants and variables. Also, group them separately. iii.) Since, we need them to find independent of x in the given binomial expansion, equate to zero the index of x and accordingly we’ll get the value of r for which there exists a term independent of x in the expansion. i.) Let Tr be the greatest term. ii.) Find Tr-1, Tr, Tr+1, from the given expansion. iii.) Put Tr/ Tr+1 ≥ 1 and Tr/ Tr-1 ≥ This will give an inequality from where value or values of r can be obtained. iv.) Then, find the rth term Tr, which is the greatest term. ii.) If k is an integer, then Tk and Tk+1 are equal and both are greatest term. To find the greatest term in the expansion of (x + y)n, write (x + y)n = xn (1 + y/x)n and then find the greatest term in (1 + y/x)n.
The middle term in the binomial expansion of (x + y)n depends upon the value of n. i.) If n is even, then there is only one middle term i.e. (n/2 + 1) th term. ii.) If n is odd, then there are two middle terms i.e. (n+1/ 2) th term and (n + 3)/ 2 th term. When there are two middle terms in the expansion, their binomial coefficients are equal. Binomial coefficient of the middle term is the greatest binomial coefficient. d.) A rational number other than positive integers. = which is an irrational number. I hope the above examples have given you a fair idea about such multiple usages of the Binomial Expansion. And, these are only a few sums and there can be a thousand others in which might not directly give you hint about the effectiveness of solving this expansion in problem solving. These applications can only be known and mastered with practice only. So, keep practicing!